Revenge is a dish best served cold … and sometimes without even knowing what the entrée is. In Chop, Will Keenan stars as a man being tortured — both psychologically and physically — by a mysterious stranger (Timothy Muskatell) who claims Keenan wronged him in the past, despite Keenan’s insistence that he simply doesn’t remember the dude. With no apologies forthcoming, Keenan is ordered to first dispatch certain family members, then pieces of his own body in Trent Haaga’s bloody horror comedy. Chop is Haaga’s directing debut and, made in 2011, still his only directing credit. Also an actor, Haaga first worked with Keenan on the set of a pair of Troma films, Terror Firmer and Citizen Toxie: The Toxic Avenger IV. They learned well under sensei Lloyd Kaufman with Chop being reasonably described as Troma-lite with a fun manic and absurdist tone with some fairly gory sequences. The basic plot for Chop might sound like a description for a short film, but screenwriter Adam Minarovich does a good job of injecting enough twists and turns to spread the material out into a satisfying feature. 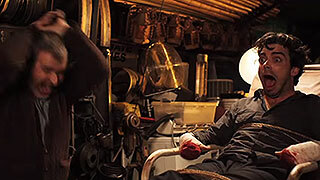 Chop won the Director’s Choice Feature Award at the 2011 Boston Underground Film Festival. Haaga and Keenan also appeared together in another non-Troma movie, Ramzi Abed’s The Devil’s Muse (2007).